Last week there was an article at Library Journal about the increase in audio books and audio sales. Audio book sales were dipping these past few years in a trend rivaled only by the decline of the mass market paperback. But sales last year were $1.47 billion, an 13.5% increase from the previous year. "Fiction continues to represent the vast majority of audiobooks sold with roughly 77.4 percent of audios being fiction vs. 22.6 percent nonfiction. The unabridged format continues to dominate with 91 percent of audiobooks sold being in this format." Are you taking advantage of the audio book revolution as either a reader or an author? 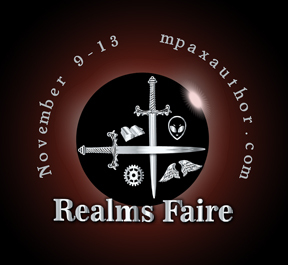 The Realms Faire is coming! From November 9-13 there will be games and prizes. You are charged with tracking down the unicorns! Every day, a new blogger will host a photo. You will have to find the unicorns in the image, much like the famous “Where’s Waldo?” Leave a comment stating how many unicorns you find in that image. The most correct guesses wins. 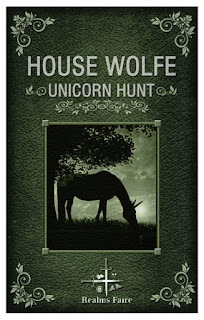 Five images - many unicorns - only one winner! More prizes are needed. Contact M. Pax if you can donate something to the pot. Returns are the bane of the publishing industry. Book returns can make or break a small publisher and destroy an author’s career before it even begins. The return agreement between bookstores and wholesalers/publishers has been in effect since the Great Depression. It’s also unique, because no other industry has such a policy. Almost a third of all books are returned, a very sobering fact. Mass market paperbacks aren’t even returned. The cover is ripped off to send back to the publisher and the book is destroyed..
Returns come from two sources—bookstores and the wholesalers & distributors who deal with these stores. Libraries and book clubs don’t return books. And only Amazon returns ebooks. The standard return policy is 90 days. Stores have three months to return books for a full credit, which includes shipping costs. 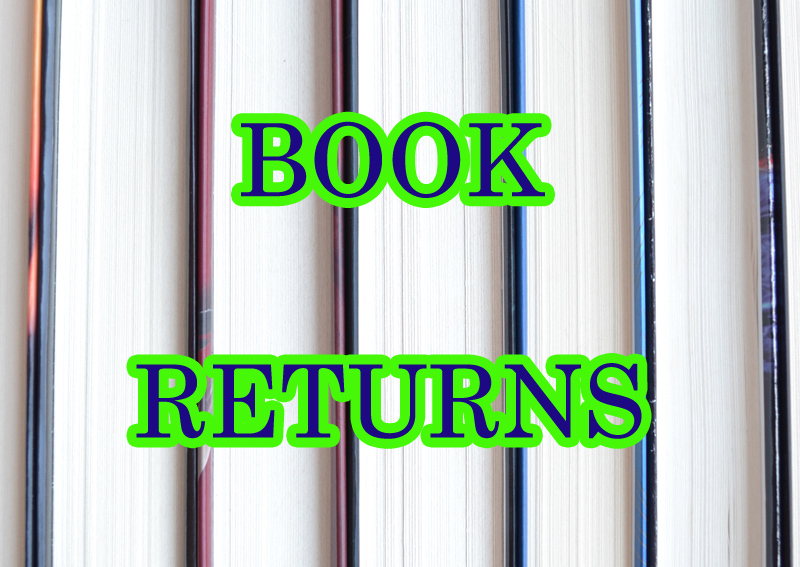 In addition, returned books rarely come back in the same pristine condition in which they were shipped. Unless they look like they were put through a shredder, the publisher has to give the store credit. And those books become a negative balance in an author’s royalty check. In a 3-month period, an author’s new book sells 10,000 copies to bookstores. The royalty statement would reflect royalties based on the amount of books that went out. But during that same 3-month period, 3000 books are returned. That is then deducted from the royalty to be paid to the author. What’s worse, is that after its initial release, in the next three months only 1000 books are sold. But returns are continuing to come in. What if another 1000 are returned? Or even worse, another 3000? And don’t forget the publisher who is now in the hole for production and marketing costs of those returned books. Returned books often can’t be resold as new. What are done with remainders and less-than-perfect books? Sometimes they are sold at a discount, donated to charity, or trashed and written off as an expense. That means the author gets a much, much smaller royalty from a returned book if it’s discounted and sold. Donated and trashed books are counted against the author’s royalties. Plus an author with a lot of returned books won’t likely see a contract for a second book. What do you think? Is it time the industry changed? Can it be changed? 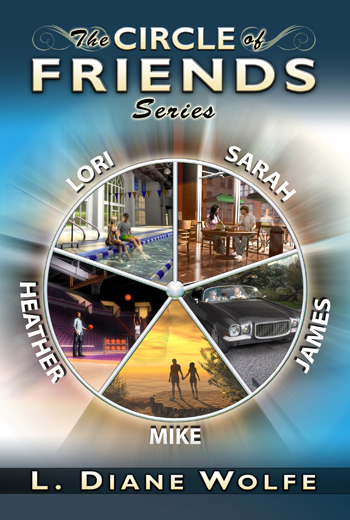 First, I am proud to announce the release of my series in a boxed set. Newly revised and edited, at the $8.99 price readers are getting 5 books for the price of 3. If you like contemporary stories with a positive twist, prepared to be inspired! Get inspired to achieve your dreams! Book I...Lori - Driven by Olympic dreams, the swimmer appears destined for success. But something is holding her back. Can the star quarterback help Lori break free and achieve her dreams? Book II...Sarah - There are no rewards for second best. Estranged from her father, envious of her best friend’s perfect life, Sarah’s unable to measure up to expectations. Can a future NFL receiver with baggage of his own make a difference? Book III...James - Haunted by a troubled past, he’s determined to break free of the abuse and start a life with Maria. When a life-changing crisis erupts, James nears the breaking point. Can he find peace before the mistakes of his father destroy him? Book IV...Mike - A prisoner of guilt for so long, he’s consumed with condemnation and unable to forgive himself. When Danielle enters his life, he can no longer hide the past. Will she be able to reach him or is Mike past the point of redemption? Book V...Heather - When confidence turns to frustration, she finds her dream of coaching basketball tarnished. Heather struggles with a dying father, a troublesome sister, and a cocky player. Can Mark help the feisty woman survive? Another policy of Amazon’s I wish they would change is their return policy. They are the ONLY one who allows ebook returns. (And that after a whole 7 days.) Many people abuse this system by either downloading a book long enough to read it or to gain “Verified Purchase” status. With digital purchases, there should be no returns. What do you think about either of those policies? These services are more successful the less people read. However, romance readers are voracious readers. And for these companies, that’s bad. But in a recently leaked letter, San Francisco startup Scribd revealed the company was planning to pull thousands of romance titles because their popularity was costing the company too much money. ...Scribd and its closest competitor Oyster pay publishers a sum of money each time “a fair portion” of a book is read. That and the fact that both Scribd and Oyster offer valuable reader data made for apparently sweet deals for publishers, who have lined up behind these services. But the deal in the end wasn’t so sweet for Scribd. “We bore the majority of the risk when establishing a business model that paid publishers the same amount as the retail model for each book read by a Scribd subscriber,” the company noted in its letter. When readers read too much, as romance readers apparently did, the costs become too much to bear. Which points to a funny irony for e-book services: as long as they pay publishers every time a book is read, their businesses are more successful the less people read. Finally, I have been working to update the Conferences, Workshops, Etc. and Publications page at the Insecure Writer’s Support Group site. We now have a full list of conferences, conventions, workshops, festivals, retreats, and seminars. There are still more to add, so I will continue working on it this summer. 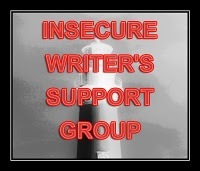 It’s time for another edition of The Insecure Writer’s Support Group, founded by Ninja Captain, Alex J. Cavanaugh. I’ve been rather stuck lately with writing. I’m working on four novelette length stories, the first two of which are done, but I had stalled on the third. There were a couple possible ways to play out the twist, but none of them seemed right. I finally discussed it with my husband during one of our walks and lo and behold, he came up with a plausible twist! I need to ask him for help more often. 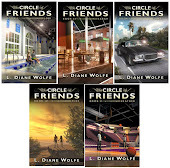 I’m also excited to announce that my series, The Circle of Friends, will soon be available in a boxed set! You can preorder now at Amazon and other retailers. 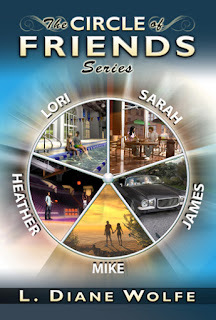 The set releases July 13th and it’s just $8.99 for all five books. Those of you looking for the benefits of traditional publishing (credibility for the author, established distribution, publisher reputation, professionally designed books, early pre-publication reviews, royalties, etc.) with the benefits of self-publishing (higher profits, more control, etc. 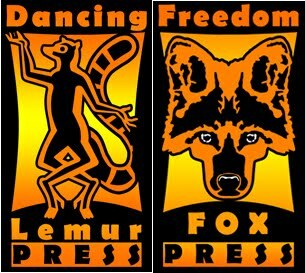 ), then check out my post last month on Freedom Fox Press. 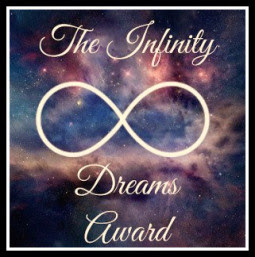 I was given the Infinity Dream Award by Chrys Fey. 1) Thank the blogger who nominated you. 2) Tell us 11 facts about yourself. 3) Answer the questions that were set for you to answer. 4) Nominate 11 bloggers and set questions for them. Here’s 11 things: I’m a vegan (total vegetarian), roller coaster junkie, can’t sing, have no sense of balance (which works in my favor on roller coaster rides), love cats, I get nostalgic when I drink wine, I’m a speed demon on the road, I have 10 Minion shirts, I have over 100 stuffed toys, I hate to dust, and I think Dunkin’ Donuts’ maple bars are the bomb. 2. What is your biggest, wildest dream? Visit every theme park in the world. 3. What are you goals for your blog for the next year? Continue with my publishing and promoting tips once a week. Plus throw in more fun stuff. Since I think everyone has received this recently, I’ll refrain from passing it on. Finally, a photo. A killdeer laid her eggs in our front lawn. 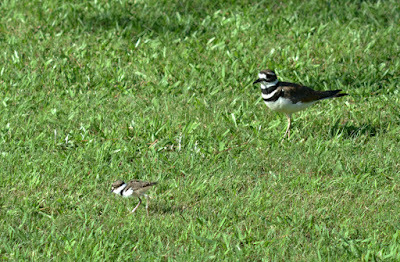 Only one hatched, but it was really cute to see him running all over our lawn.